While browsing for good books on the NYT Bestseller list, I came across a unique book called Room. You can purchase it for the Kindle 3 or Kindle DX for $11.99. The Kindle version is the best deal available from the format selections. 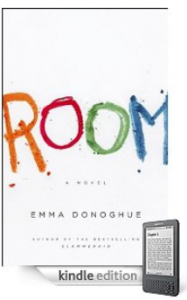 Room, by Irish author Emma Donoghue, is a “riveting and suspenseful” story that will “absolutely take your breath away” according to reviewers. One of the factors that makes this book so powerful is that it is from the perspective of a 5 year old who is confined to one room for years with his mother. Jack’s perception of life outside of the Room is limited to what he watches on TV. Televion often provides a skewed viewpoint of life. He and his mother, “Ma” have daily rituals and games they play together, and they form a tight bond. Old Nick provides them with food and other necessities from the outside. His character is rather ominous because Jack must hide in the wardrobe when he comes to visit every night. This book reflects on the idea of being content with situations that are the only ones you’ve known. Jack is pretty happy living in the Room because he knows nothing about the outside. Ma on the other hand, was kidnapped and has been trapped in the space for seven years. She has experienced the freedom of the outside world, and being stuck in the Room has a profound mental effect on her. When exposed to the world beyond the Room, Jack is overwhelmed by the noise and activity that goes on. I think this is a really interesting perspective because it is from someone who has to jump head first into something that most of society has had the chance to naturally adapt to. Room makes me also think of how socially isolated the world has become due to technology and connection via the internet. We can build a social network and interact through chat, games and even virtual worlds all in the comfort of our own home. So, I wonder if eventually the outside world will seem just as overwhelming as it did to Jack? This book has amazing reviews and is definitely worth checking out. This entry was posted in Good Kindle Books At A Glance, Kindle Books, NYT Best Sellers and tagged Emma Donoghue, Room by holly. Bookmark the permalink.